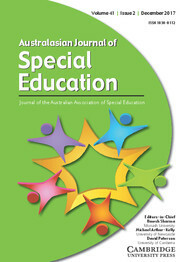 The Australasian Journal of Special Education publishes articles for a readership professionally engaged or interested in the education of students with special needs or the education of those who will work these students. The journal features an applied section Special Education Perspectives to inform practicing teachers in regular and special education settings and others interested in the education of students with special needs. The Australian Association of Special Education (AASE) aims to enhance access for students with special education needs to quality educational programs, promote professional standards of a high order and to support research that informs the delivery of special education in the Australian context.